Growers and landscapers stand to gain when community members create edible-friendly green spaces on public lands. If you haven’t heard of food forests before, you will soon. The concept grew out of the permaculture movement of the 1970s and has risen in popularity over the last few years due to social and environmental issues related to food security. Food forests are an idea whose time has finally come. What is a food forest? It is a tract of land densely planted with flora that work together to sustain itself as well as provide an abundance of edible products. A food forest is a sustainable ecosystem where not all plants are edibles. Food forests include a mix of trees, shrubs, grasses, perennials and herbaceous plants that feed the soil, attract wildlife and pollinators, establish wind breaks, provide crafts and support structures. By some estimates there are more than 50 and as many as 100 food forests already in the United States in locations from Los Angeles to Austin, Texas, to Seattle, to Philadelphia. Their sizes vary greatly, from small residential-sized lots to a few acres. In the last half-year alone at least a dozen projects nationwide have been announced — in Ames, Iowa; Gulfport, Florida; Seaside, California; and Camden, New Jersey, to name a few — and more are being sowed every month. The rise of food forests is a confluence of events. Discussions have been percolating for years about uses for public land, including opportunities to support food production and to connect neighbors. The idea has gained traction most recently among Millennials, who are deeply concerned about what they and their kids eat. College campuses and communities have seen renewed interest in courses about sustainability and permaculture. This is a movement of the people. Food forests are, in most instances, private-public ventures whereby community members organize meetings, labor, resources, design and fundraising. Citizens petition city officials to understand their desire to create a food forest as they seek approval for such projects. Food forests also present a wide range of new marketing possibilities for growers. As homeowner associations hire landscapers to design and build food forests in new and existing neighborhoods, growers can tap into this market by supplying the vast array of edible and nonedible species. Food forests follow a planting system based on seven vertical layers and plant guilds. The system takes advantage of plant morphologies and physiologies to optimize sunlight, water, nutrients and structural needs of the plants. The layers are as follows. 1. Standard fruit and large nut trees, such as pecan and oak, form the uppermost layer, the high canopy, and are planted with space to ensure light hits lower layers. 2. Smaller trees, such as plums, apricots and mulberries and dwarf varieties, form the upper canopy. 3. The shrub layer has flowering and fruiting plants, such as roses and blueberries, to attract wildlife. 4. The herbaceous layer can be first established with annuals and perennials, including culinary herbs, flowers, perennial vegetables and living mulches. 5. Ground covers, such as creeping raspberries, strawberries and thyme, are planted to suppress the growth of weeds. 6. The vertical, or vine, layer is made up of grapes, akebia, kiwis and nasturtiums, which use the trees for structural support. 7. The rhizosphere, or root, layer is planted with shallow-rooted plants such as radishes and onions. Cramer said food forests serve cultural needs, too. “For our neighborhood, it’s Asian, but there is growing East African and Latino influence,” she said. Beacon Food Forest has flourished through community, volunteer and city support, but like many food forests, this Seattle-based project was developed by a few dedicated individuals. It was initiated in 2009 by Glenn Herlihy and Jacqueline Cramer, who crafted a design as part of a permaculture class. The site, located about two miles from downtown Seattle on a seven-acre property owned by Seattle Public Utilities, supports a variety of goals from food production to education. When Herlihy and Cramer presented their plan, the city of Seattle was interested but required input from the community. Concerns about the food forest’s proximity to a city water supply had to be addressed, and other changes were made so that it better fit existing regulations. Although blueberries were outside the classic permaculture design, Herlihy said U-pick blueberries were repeatedly requested by community members. The result was a design adjustment that included 80 blueberry bushes, which went into the phase-one planting of 1.75 acres of the total seven. Phase one has taken three years to complete. It includes more than a dozen herbs, more than 25 berry bushes (in addition to the blueberries), shrubs and ground covers, approximately 30 fruit trees and nut trees, and more than 90 native plants and pollinator attractors such as flowers, herbs and shrubs. The other 5.25 acres are maintained as mowed areas, but the next 1.75 acres are slated for a phase-two planting over the next two to three years. After six years, Beacon Food Forest is viewed as a model project, receiving national and international visitors. Its success is helping shift political and social opinion about edible plants and public spaces, making city planners look more favorably on trees and plants that were once considered a nuisance or liability. Concerns of city officials range from vandalism and homeless people stealing food, to food rotting in place. For more information about the project, visit www.beaconfoodforest.org. Elizabeth Walsh is a co-founder of the 2.43-acre Festival Beach Food Forest in Austin, Texas (www.festivalbeach.org). Walsh was a resident of the Festival Beach Food Forest’s neighborhood and a doctoral student in community and regional planning. There was strong public support for this project to go forward in Austin, even with its challenges. Backers included economic development and landscape groups, city officials, community members and others. “They loved the idea, but they didn’t know how to deal with us — we didn’t fit into a cubicle of community garden or parklands either,” said Mitch Wright, the landscape architect who drew the plans for the food forest. The city departments had to alter how they looked at the use of land and who had oversight of the food forest. Is it urban forestry? A community garden project? What would happen if someone fell from a tree? “We had to develop a significant maintenance agreement, a park land improvement agreement, that indemnifies the city,” Wright said. The agreement identified the project as private work done on public land. At this writing, phase one is almost done, using a plant list that changed dramatically over time. The project moved forward with nearly 100 trees and dozens of other nonedible species planted on only .6 acres. Berm guilds were planted with some 20 nonedible species of trees to serve as visual and noise pollution screens as well as for their use as fibers and poles, said Christopher Sanchez, a liaison from the City of Austin Parks and Recreation Department. Each phase of the project requires a new plant list be approved by the city, Wright said. Currently, the Festival Beach Food Forest is gearing up for its next phase and the installation of hundreds more plants. 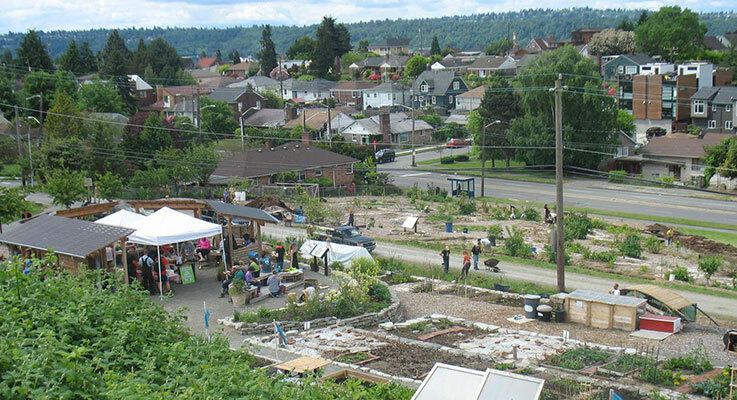 The Austin and Seattle food forests are only two examples of city projects. Many more are gearing up nationwide, with nonprofits, churches and individual community activists serving as leaders in a movement that stands to benefit the nursery industry.